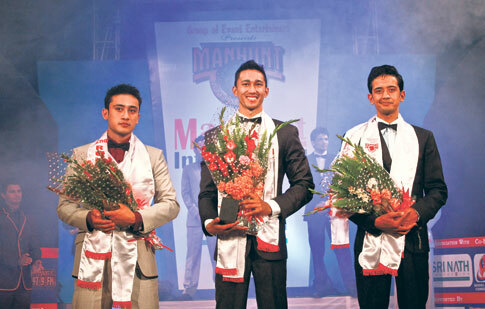 The final event for Manhunt International Nepal 2012 was held at Army Officer’s Club on October 19, Friday and Sanish Shakya was declared as the winner of the prestigious title. Dikpal Karki and Bikesh Shrestha were awarded the title of first runner up and second runner up respectively. From L to R: Bikesh Shrestha, Sanish Shakya and Dikpal Karki. Out of 12 participants, eight were short listed for the semi final round in which they answered questions from the panel of judges. Five finalists Sanish Shakya, Dikpal Karki, Sandip Karki, Deepak Bhatta and Bikesh Shrestha were selected on the basis of their performance in the semi final round. They were asked to write about their social commitment and responsibility as the winner of Manhunt International Nepal 2012 for the final question by President of Image Channel, R K Manandhar. Manhunt International Nepal 2012 Sanish Shakya will be representing Nepal in Manhunt International 2012 in Bangkok from November 1 to 11, 2012. The event, organized by Group of Event Entertainers (GEE), also saw some performances. Musician Shyam Nepali played two of his compositions on Sarangi and a ‘Kal Bhairab Nritya’ was also presented during the program.